Trigger 9: Blazing Strike 은 고전 2D 격투게임을 독창 적이고 모던한 룩으로 재해석한 게임입니다. 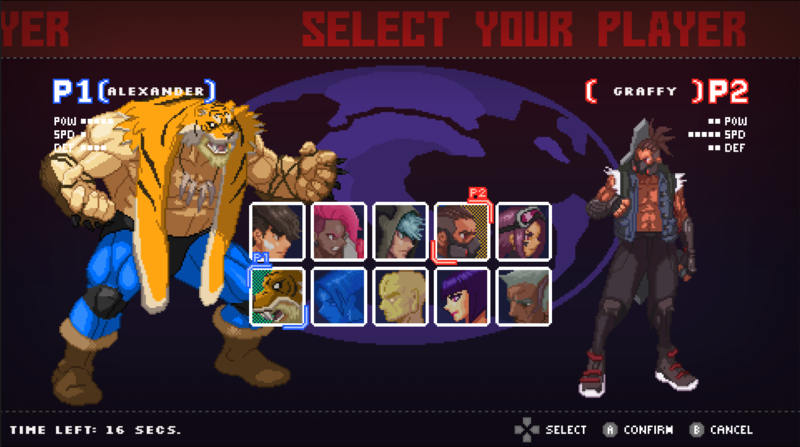 Trigger 9: Blazing Strike is a classic 2D style fighting game reimagined with unique look and feel. With combat mechanics already familiar to games like Street Fighter and The King of Fighters, we have merged in our own unique elements to create a fighting system that focuses on timing and anticipation. Blazing Strike has been greenlit on Steam, and is set to be released on PS4 as well. Target release date is 2018. Trigger 9: Blazing Strike 은 고전 2D 격투게임을 독창 적이고 모던한 룩으로 재해석한 게임입니다. 이미 대중에게 잘 알려진 게임플레이를 바탕으로 저희만의 격투 시스템을 도입하여 커멘드 입력 위주보다는 타이밍과 상대의 움직임을 예측하는 플레이에 집중할 수 있도록 하였습니다. Blazing Strike는 스팀에서 그린라이트를 받은 상태이며, 소니 플레이스테이션 4 에서도 출시될 예정입니다. 현재 출시일은 정해지지 않았지만 2018년 출시를 목표하고 있습니다. The creator of Trigger 9: Blazing Strike is Golden Child. We are a two-man indie game dev studio, and we love making games! 저희는 현재 Trigger 9: Blazing Strike 를 개발 중에 있는 골든차일드 입니다. 골든차일드는 두명의 개발자가 자신들이 좋아하는 게임을 만들기 위해 뭉친 인디 스튜디오입니다.